A team of researchers at Johns Hopkins discover the biochemical mechanism that tells cancer cells to break off from the primary tumor and spread throughout the body. A process known as metastasiS. That word scares the bejeebers out of patients diagnosed with cancer. 90% of cancer deaths are caused when cancer metastasizes. Anything that helps prevent that from happening is a tremendous breakthrough in medicine. Hasini Jayatilaka, left, a post-doctoral fellow and Denis Wirtz, professor of chemical and biomedical engineering, who work together at the Institute of NanoBioTechnology at Johns Hopkins University, discuss their discovery. BALTIMORE – Hasini Jayatilaka was a sophomore at the Johns Hopkins University working in a lab studying cancer cells when she noticed that when the cells become too densely packed, some would break off and start spreading. She wasn’t sure what to make of it, until she attended an academic conference and heard a speaker talking about bacterial cells behaving the same way. Yet when she went through the academic literature to see if anyone had written about similar behavior in cancer cells, she found nothing. Seven years later, the theory Jayatilaka developed early in college is now a bona fide discovery that offers significant promise for cancer treatment. Jayatilaka and a team at Johns Hopkins discovered the biochemical mechanism that tells cancer cells to break off from the primary tumor and spread throughout the body, a process called metastasis. Some 90 percent of cancer deaths are caused when cancer metastasizes. 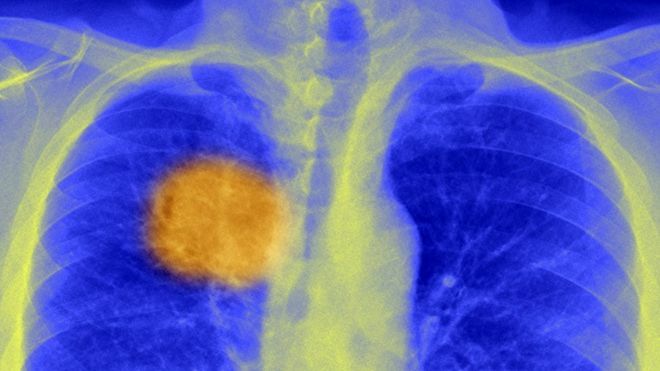 The team also found that two existing, FDA-approved drugs can slow metastasis significantly. “A female patient with breast cancer doesn’t succumb to the disease just because she has a mass on her breast; she succumbs to the disease because (when) it spreads either to the lungs, the liver, the brain, it becomes untreatable,” said Jayatilaka, who earned her doctorate in chemical and biomolecular engineering this spring in addition to her earlier undergraduate degree at Hopkins. The study was published online May 26 in the journal Nature Communications. The next step for the team is to test the effectiveness of the drugs in human subjects. Typically, cancer research and treatment has focused on shrinking the primary tumor through chemotherapy or other methods. But, the team said, by attacking the deadly process of metastasis, more patients could survive. “It’s not this primary tumor that’s going to kill you typically,” said Denis Wirtz, Johns Hopkins’ vice provost for research and director of its Physical Sciences-Oncology Center, who was a senior author on the paper. Jayatilaka began by studying how cancer cells behave and communicate with each other, using a three-dimensional model that mimics human tissue rather than looking at them in a petri dish. Many researchers believe metastasis happens after the primary tumor reaches a certain size, but Jayatilaka found it was the tumor’s density that determined when it would metastasize. When the tumor reaches a certain density, the study found, it releases two proteins called Interleukin 6 and Interleukin 8, signaling to cancer cells that things had grown too crowded and it was time to break off and head into other parts of the body. Previously, Wirtz said, the act of a tumor growing and the act of cancer cells spreading were thought to be very separate activities, because that’s how it appeared by studying cancer cells in a petri dish, rather than the 3-D model the Hopkins team used. Many researchers study only cancer cell growth or its spread, and don’t communicate with each other often, he said. Once the cancer cells start to sense the presence of too many other cancer cells around them, they start secreting the Interleukin proteins, Wirtz said. If those proteins are added to a tumor that hasn’t yet metastasized, that process would begin, he said. The team then tested two drugs known to work on the Interleukin receptors to see if they would block or slow metastasis in mice. They found that using the two drugs together would block the signals from the Interleukin proteins that told the cancer cells to break off and spread, slowing – though not completely stopping – metastasis. The drugs the team used were Tocilizumab, a rheumatoid arthritis treatment, and Reparixin, which is being evaluated for cancer treatment. The drugs bind to the Interleukin receptors and block their signals, slowing metastasis. Though metastasis was not completely stopped, Jayatilaka said, the mice given the drug cocktail fared well and survived through the experiment. She said adding another, yet-to-be-determined drug or tweaking the dose might stop metastasis entirely. Contrary to the hair loss, nausea and other negative side effects patients undergoing chemotherapy suffer, Wirtz said the side effects from the drugs used in the study would be minimal. Anirban Maitra, co-director of a pancreatic cancer research center at the MD Anderson Cancer Center at the University of Texas, cautioned that clinical trials in humans are needed to prove the theory. “There’s a risk that something that looks so great in an animal model won’t pan out in a human,” he said. But Maitra said the study looked promising, in particular because the researchers had used drugs already on the market. It can take a decade to identify a drug that would perform similarly and get it approved, and many similar observations don’t advance because of the time and expense it can take to get drug approval, he said. Zaman said it was important for cancer researchers to use engineering to better understand cancer, as the Hopkins team did. Wirtz predicted a future where cancer would be fought with a mix of chemotherapy to shrink the primary tumor and drug cocktails like the one the Hopkins team developed to ensure it would not metastasize. He compared such a treatment to how HIV/AIDS is treated today. Immunotherapy, which uses the body’s immune system to fight cancer, also could play a role in a combined method, Wirtz added. TRICE MEDICAL closes $19.3M in Series C financing for their tiny needle-based camera to analyze joint injuries and expedite orthopedic diagnosis without the need for an MRI. Mi-Eye2 is a hand-held imaging scope which received FDA-clearance. It enables doctors to diagnose a sports-related injury in the office, without an MRI. It consists of a hypodermic needle with a small camera tethered to a Microsoft surface tablet that shows high-definition pictures. Jeffrey O’Donnell, Sr. who is President and CEO of Trice Medical says this latest round of financing is a “significant milestone” and will help expand the company’s U.S. market. CBS 2’s DR. MAX GOMEZ: If you’ve ever injured your knee it can be hard to tell exactly what’s causing the pain, so the doctor usually sends you for an expensive MRI and maybe an arthroscopy in the O.R. to take a look inside. But what if you could do a scope in the doctor’s office cheaper and safer. DR. MAX GOMEZ: Two MRIs later, it still wasn’t completely clear what was causing his knee pain. DR. MAX GOMEZ: Worse yet, Liz is claustrophobic in an MRI. “I hate em, I’m claustrophobic. I’m out, I’m in, I’m out again,” she said. DR. MAX GOMEZ: The next is usually a trip into the operation room to look around by sticking a scope in the knee. It’s expensive and requires anesthesia. Why not do that in the office, under a local anesthesia? DR. MAX GOMEZ: Using only a local anesthesia, Dr. Gladstone inserts the MI-Eye-2™ into Liz’s knee. She was actually watching the same thing Dr. Gladstone was seeing. It allows him to check and see what and where there’s damage inside the knee. “Almost as good as O.R. scope, and in many ways better than MRI because it can give you direct visualization,” Dr. Gladstone said. DR. MAX GOMEZ: Better yet, if the damage is minimal it saves the patient a trip to the O.R. for a conventional scope, and here’s the best part; it costs under $500 to do this in the doctor’s office as opposed to the $1,500 or $2,000 for an MRI and thousands more for an O.R. scope. Almost any joint that you can scope can be done with the MI-Eye™: shoulder, wrist, ankle, elbow. Maria Dorfner, a 33 year veteran of broadcast news is the founder of this blog. DANIELA SEMEDO reports on a European project, which aims to develop an innovative endoscope device that can detect and diagnose colorectal cancer in its early stages. Called PICCOLO, the project is funded under the European Union’s Horizon 2020 program. It’s tackling one of the world’s predominant cancers by using new optical technologies that identify precancerous polyps and early colon cancers. Colorectal cancer represents around one-tenth of all cancers worldwide, and nearly 95 percent of these cases are adenocarcinomas, which typically start as a tissue growth called a polyp. Early and accurate diagnosis and precise intervention can increase cure rates to up to 90 percent. A colonoscopy is currently the method used to screen for colon cancer. But while up to 40 percent of patients who undergo colonoscopy present one or more polyps, almost 30 percent of these polyps are not detected. Of the polyps detected by colonoscopy, 29 to 42 percent are generally hyperplastic and will not develop into cancer. The remainder are neoplastic polyps, representing colorectal cancer in its earliest stages. There is an urgent need for new diagnostic techniques that are equipped with enough sensitivity and specificity to allow in situ assessment, safe characterization, and resection of lesions during clinical practice interventions. The multidisciplinary PICCOLO team proposes a new compact, hybrid, and multimodal photonics endoscope based on Optical C, a medical imaging technique that uses light to capture micrometer-resolution, three-dimensional images from within optical scattering media. Researchers behind the project believe the new device may not only add to colon cancer detection, but could also be applied to diseases in other organs of the body. Investigators expect their first prototype to be fully developed by the end of 2018 and plan to start testing the device in clinical studies in 2020. Maria Dorfner is the founder of NewsMD: What’s Hot in Health, a division of Healthy Within Network. Have a story to share with healthcare consumers and media? There is now a non-surgical alternative to gastric bypass. It’s for people with a BMI of at least 30-40 who despite changing habits can’t lose weight. It’s called ORBERA and it involves inflatable balloons that help you shed 20 to 80 pounds. ORBERA balloon is inserted down throat and into stomach using an endoscope in less than 30 min. The balloons are then filled with saline, filling up space in the stomach. The Food and Drug Administration recently approved the dual balloon technology and NYC Gastroenterologist Dr. Prem Chattoo of Hudson River Gastroenterology is one of the first doctors to offer the procedure. His office is located in lower Manhattan. “It’s not a long term solution like bariatric surgery. The procedure is used for a quick, six-month weight loss to get rid of 10 percent of your body weight. After six months, the balloon is removed and you should see a pretty noticeable weight loss,” Dr. Chattoo says. The end result is weight loss and reduced hunger. After the procedure, ORBERA has a 12-month diet and exercise program to follow. The biggest benefits about ORBERA, according to Dr. Chattoo, are that no abdominal surgery is needed and that the procedure is completed in the same day. The procedure is recommended to those with a body mass index (BMI) of 30-40 or those who have other risk factors for heart disease such as diabetes or high blood pressure. A BMI or 30 or higher is defined as obese. More than a third of U.S. adults fit that range. The procedure costs 6-8K and is not covered by insurance. One procedure will be donated for free to one person in need who meets requirements. Contact: maria.dorfner@yahoo.com Write: Orbera in Subject, include your contact information. “Always remember the benefits of daily exercise for your mind, body and spirit. If you hate or dread exercise start with walking. Break it up into 15 minutes at a time until you reach 30 minutes. Then, increase it to 45 or 60 minutes. You don’t even need a gym to do that. Remove all junk food from your home. Load up on healthy snacks. Remove all processed foods and soda. Drink lots of water. You’ll begin to notice a difference in 6 months. In one year, it will all be a habit. No matter what help you get surgically or non-surgically, you always want to strive to develop lifelong healthy habits. Address the underlying of ‘why’ you select unhealthy foods. Stressed? Find someone to talk to. There are lots of free counselling services where you can call and talk to someone confidentially. Rushed? Fix meals the night before. Hate your job? Start looking for a new one. Sit at a computer all day? Get up every 15 minutes and walk around office. Take stairs. Depressed? Again, find someone to talk to and exercise daily. Make an appointment with a professional psychologist if it’s really bad. When exercising, don’t focus on the physical. Focus on the mental benefits when you start. Physical has a way of catching up when you fix your mind and thoughts first. Stay positive. Good things take commitment, dedication and time. MARIA DORFNER is the founder of NewsMD Communications and Healthy Within Network. This blog is a part of that. She began her career in 1983 at NBC News in NYC where she continued to work behind-the-scenes on TODAY SHOW, NIGHTLY NEWS and all programs until 1989 when she helped launch CNBC. As a producer, she has produced talk shows, segments and series and travelled extensively. In 1993, she developed and senior produced 7 health series: Healthy Living, Healthcare Consumers, Healthcare Practitioners, Lifestyles and Longevity and Green Magazine. She co-anchored Healthy Living and Healthcare Consumers airing on CNBC for three years before launching NewsMD Communications. Her clients include a Who’s Who in Medical/Health, the Journal of the American Medical Association (JAMA) which she shot, wrote and produced weekly segments for NBC, CBS, ABC, CNN and Fox. Discovery Health Channel, where she wrote, produced and directed the documentary series, 21st Century Medicine. She has helped raise multi-millions of dollars for hospitals in need and has been a part of several successful health startups. She has worked as Director of Research for Roger Ailes at Ailes Communications, his consulting and production company and again as a producer. Her articles have been published in Broadcasting & Cable Magazine and she has hosted The Secret to Success. She has continued to be a go-to person for network heath shows, stories and content. She was awarded a health reporting scholarship from The American Medical Association (AMA), a Freddie Award for Excellence in Medical Reporting, an Outstanding Achievement Award from the March of Dimes, an Angel of a Sponsor Award from Make A Wish Foundation and an Outstanding Leadership Abilities from her alma mater, Pace University and Commitment to the Advancement of Women in Media Award. In 2014, she published 3 books. She was also awarded a scholarship to Columbia University by NBC News. She also received Media Recognition Award from the American Heart Association for her series Heart Smart. She has been specializing in Medical/Health for 23 years, and has worked in Media for 33 years after starting as an intern during college. In her spare time, she enjoys reading, learning, writing, nature, hiking, swimming, bike riding, working out, cooking, exploring museums and travel. She is a certified scuba diver and aerobics swim instructor. Thanks for following my health blog. Innovations in soft materials and electronics are helping researchers create wearable electronic patches. No more tough breaks. As “smart” electronics get smaller and softer, scientists are developing new medical devices that could be applied to — or in some cases, implanted in — our bodies. And these soft and stretchy devices shouldn’t make your skin crawl, because they’re designed to blend right in, experts say. We want to solve the mismatch between rigid wafer-based electronics and the soft, dynamic human body, said Nanshu Lu, an assistant professor of aerospace engineering and engineering mechanics at the University of Texas at Austin. Lu, who previously studied with John Rogers, a soft-materials and electronics expert at the University of Illinois Urbana-Champaign, focuses her research on stretchable bioelectronics. Lu and her colleagues have invented a cheaper and faster method for manufacturing electronic skin patches called epidermal electronics, reducing what was a multiday process to 20 minutes. Smart and flexible enough to essentially meld with the human body. From the latest advancements in smart tattoos to injectable brain monitoring to stretchable electronics for drug delivery, here are five fascinating technologies that could soon be on (or inside) your body. “When you integrate electronics on your skin, it feels like part of you,” Lu said. “You don’t feel it, but it is still working.” That’s the idea behind “smart” temporary tattoos that John Rogers and his colleagues are developing. Their tattoos, also known as biostamps, contain flexible circuitry that can be powered wirelessly and are stretchy enough to move with skin. These wireless smart tattoos could address clinically important — but currently unmet — needs, Rogers told Live Science. Although there are numerous potential applications, his team is focused now on how biostamps could be used to monitor patients in neonatal intensive care units and sleep labs. MC10, the Massachusetts-based company Rogers helped start, is conducting clinical trials and expects to launch its first regulated products later this year. Nanoengineers at the University of California, San Diego, have tested a temporary tattoo that both extracts and measures the level of glucose in the fluid in between skin cells. Another new body-meld technology in development is a wearable biochemical sensor that can analyze sweat through skin-mounted devices and send information wirelessly to a smartphone. These futuristic sensors are being designed by Joseph Wang, a professor of nanoengineering at the University of California, San Diego, and director of the Center for Wearable Sensors. “We look at sweat, saliva and tears to provide information about performance, fitness and medical status,” Wang told Live Science. Earlier this year, members of Wang’s lab presented a proof-of-concept, flexible, temporary tattoo for diabetics that could continuously monitor glucose levels without using needle pricks. He also led a team that created a mouth-guard sensor that can check levels of health markers that usually require drawing blood, like uric acid, an early indicator for diabetes and gout. Wang said the Center for Wearable Sensors is pushing to commercialize these emerging sensor technologies with the help of local and international companies. Dae-Hyeong Kim, an associate professor of chemical and biological engineering at Seoul National University in South Korea, and his colleagues are pursuing nanotechnologies to enable next-generation biomedical systems. Kim’s research could one day yield nanomaterial-enabled electronics for drug delivery and tissue engineering, according to Lu. “He has made stretchable memory, where you can store data on the tattoo, ” she said. In 2014, Kim’s research group made a stretchable, wearable electronic patch that contains data storage, diagnostic tools and medicine. “The multifunctional patch can monitor movement disorders of Parkinson’s disease,” Kim told Live Science. Collected data gets recorded in the gold nanoparticle device’s memory. When the patch detects tremor patterns, heat and temperature sensors inside it release controlled amounts of drugs that are delivered through carefully designed nanoparticles, he explained. This nanoscale electronic mesh can be injected into brain tissue through a needle. Although implantable technology exists for monitoring patients with epilepsy or brain damage, Lu pointed out that these devices are still sharp and rigid, making long-term monitoring a challenge. She compared soft brain tissue to a bowl of tofu constantly in motion. “We want something that can measure the brain, that can stimulate the brain, that can interact with the brain — without any mechanical strain or loading,” she said. The e-Dura spinal cord implant. Stéphanie Lacour and Grégoire Courtine, scientists at the École Polytechnique Fédérale de Lausanne’s School of Engineering, announced in early 2015 that they had developed a new implant for treating spinal cord injuries. The small e-Dura device is implanted directly on the spinal cord underneath its protective membrane, called the dura mater. From there, it can deliver electrical and chemical stimulation during rehabilitation. The device’s elasticity and biocompatibility reduce the possibility of inflammation or tissue damage, meaning it could stay implanted for a long time. Paralyzed rats implanted with the device were able to walk after several weeks of training, the researchers reported in the journal Science. Lu called e-Dura one of the best-functioning, long-term implantable flexible stimulators. “It shows the possibilities of using implantable, flexible devices for rehabilitation and treatment,” she said. Meanwhile, technologies that replicate human touch are growing increasingly sophisticated. Stanford University chemical engineering professor Zhenan Bao has spent years developing artificial skin that can sense pressure and temperature and heal itself. Her team’s latest version contains a sensor array that can distinguish between pressure differences like a firm or limp handshake. Lu said she and her colleagues in this highly multidisciplinary field hope to make all wafer-based electronics more epidermallike. “All those electronic components that used to be rigid and brittle now have a chance to become soft and stretchable,” she said. Be sure to FOLLOW this blog for updates on What’s Hot in Health.